The Fifty-third United States Congress was a meeting of the legislative branch of the United States federal government, consisting of the United States Senate and the United States House of Representatives. It met in Washington, D.C. from March 4, 1893, to March 4, 1895, during the first two years of Grover Cleveland's second presidency. The apportionment of seats in the House of Representatives was based on the Eleventh Census of the United States in 1890. Both chambers had a Democratic majority. March 4, 1893: Grover Cleveland became President of the United States for a second time. May 5, 1893: Panic of 1893: A crash on the New York Stock Exchange started a depression. May 1, 1894: Coxey's Army, the first significant[to whom?] American protest march, arrived in Washington, D.C. Senators were elected by the state legislatures every two years, with one-third beginning new six-year terms with each Congress. Preceding the names in the list below are Senate class numbers, which indicate the cycle of their election. In this Congress, Class 1 meant their term began in this Congress, requiring reelection in 1898; Class 2 meant their term ended in this Congress, requiring reelection in 1894; and Class 3 meant their term began in the last Congress, requiring reelection in 1896. 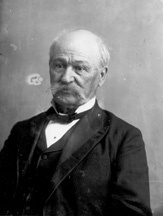 John Allen was appointed to serve until March 20, 1893, but the Senate rejected his credentials. (3) Leland Stanford (R) Died June 21, 1893. (2) Edward C. Walthall (D) Resigned January 24, 1894, due to ill health. 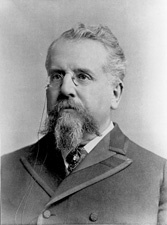 (3) Edward D. White (D) Resigned March 12, 1894, to become Associate Justice of the U.S. Supreme Court. (2) Alfred H. Colquitt (D) Died March 26, 1894. (3) Zebulon B. Vance (D) Died April 14, 1894. (1) Francis B. Stockbridge (R) Died April 30, 1894. Official Congressional Directory for the 53rd Congress, Extraordinary Session. Official Congressional Directory for the 53rd Congress, 1st Session. Official Congressional Directory for the 53rd Congress, 2nd Session. Official Congressional Directory for the 53rd Congress, 2nd Session (1st Revision). Official Congressional Directory for the 53rd Congress, 2nd Session (2nd Revision). Official Congressional Directory for the 53rd Congress, 2nd Session (3rd Revision). Official Congressional Directory for the 53rd Congress, 3rd Session. Official Congressional Directory for the 53rd Congress, 3rd Session (Revision).